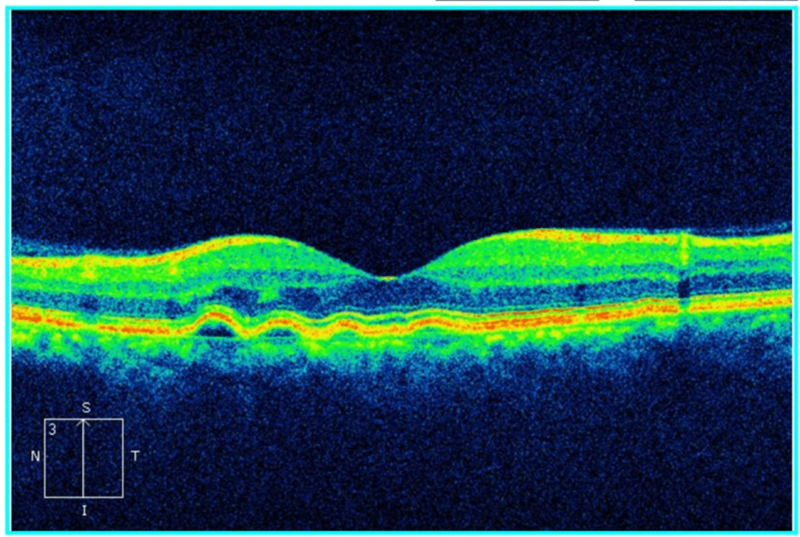 HPI: A 52 year old man referred to Illinois Retina Associates for blurred vision in the right eye. 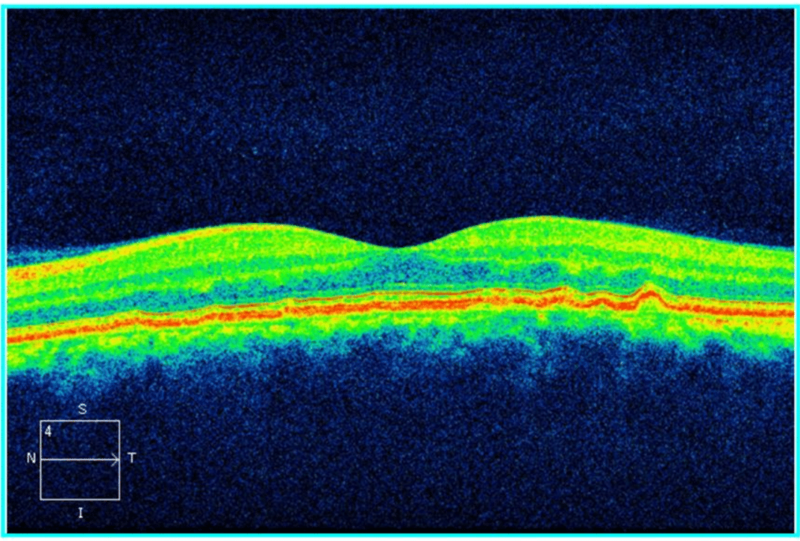 The blur has been worsening in the central vision over the preceding 2 months. There were no symptoms in the other eye. Past medical history: The patient was healthy and not on any medications. Vision was 20/200 in the right eye and 20/25 in the left ye. Pressures were normal. There were mild cataracts in both eyes. The posterior exam was notable for subretinal hemorrhage in inferiorly in the right eye (figure 1) and a solitary CHRPE in the left eye. The right eye showed hyper-reflective subretinal material inferiorly. The left eye showed pigment epithelial detachments. Right eye showed polypoidal changes in the ICG without leakage on the FA. The left eye was unremarkable. Right eye also shows the thickened vessel in the choroid. 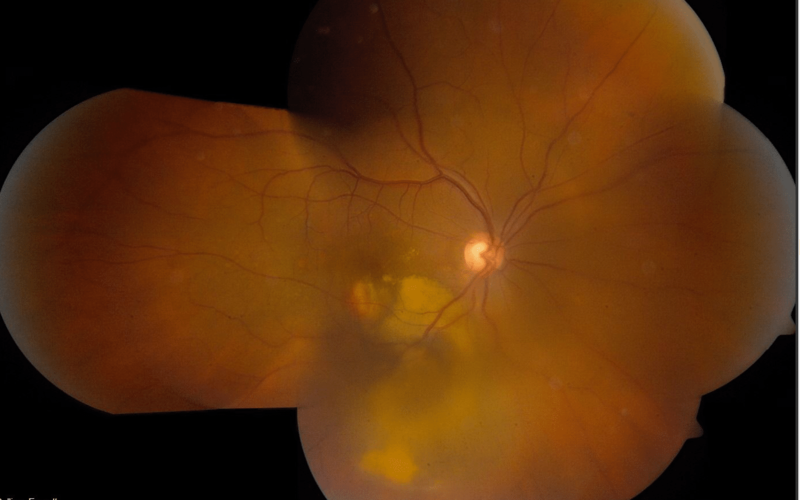 Given the thickened vessel in the choroid characteristic of a polyp and the lack of findings consistent with choroidal neovascularization on FA, the diagnosis of Polypoidal Choroidal Vasculopathy was made. The patient was treated with intravitreal bevacizumab and his vision improved to 20/50 from 20/200 in the right eye. Polypoidal choroidal vasculopathy is an exudative macular disease that shares some characteristics with age-related macular degeneration. Both are causes of fluid and bleeding in the macula that increase in frequency with increasing age. While age-related macular degeneration is most common in Caucasians, polypoidal choroidal vasculoptahy is more commonly seen in those of Asian, Hispanic or African descent. 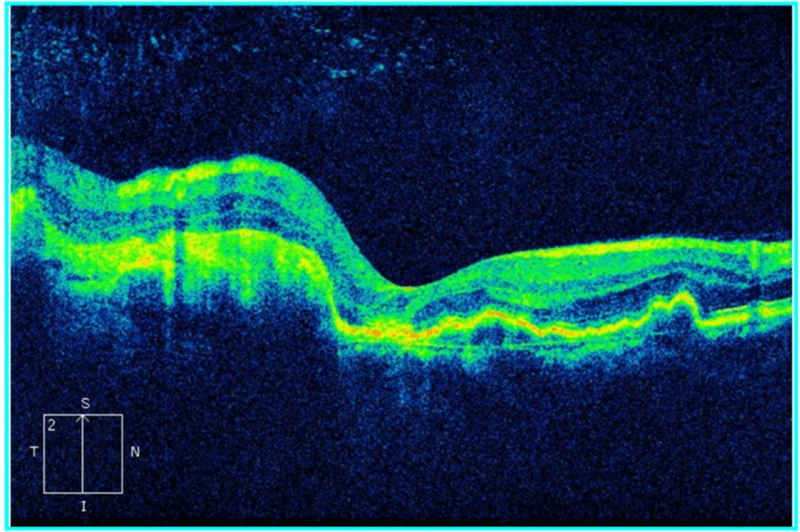 The underlying cause is an abnormality in the choroidal circulation that results in a dilated choroidal vessel, known as a polyp. 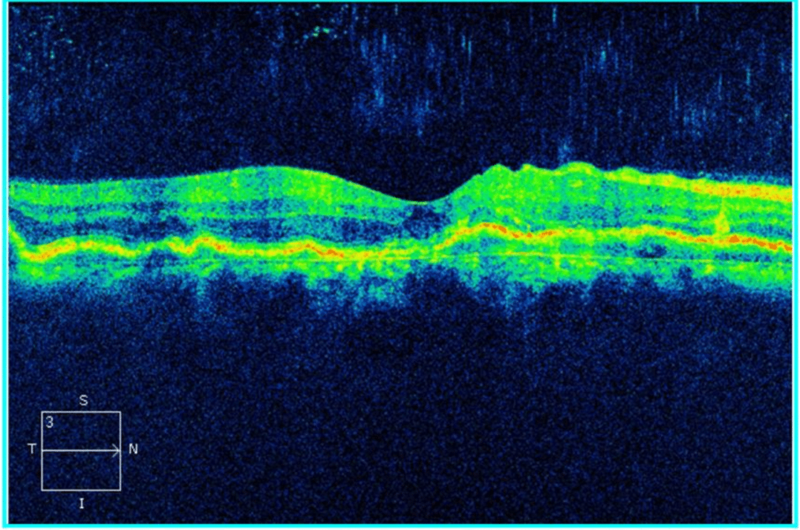 Because these vessels are primarily seen only with ICG, this condition is likely frequently underdiagnosed. Treatment is similar to that of exudative age-related macular degeneration. 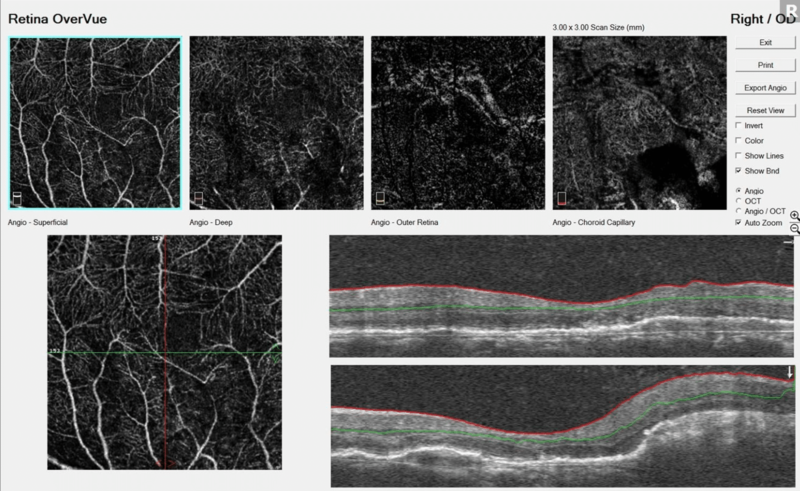 These patients often have an improvement in fluid and vision with intravitreal anti-VEGF (Vascular endothelial growth factor) agents. 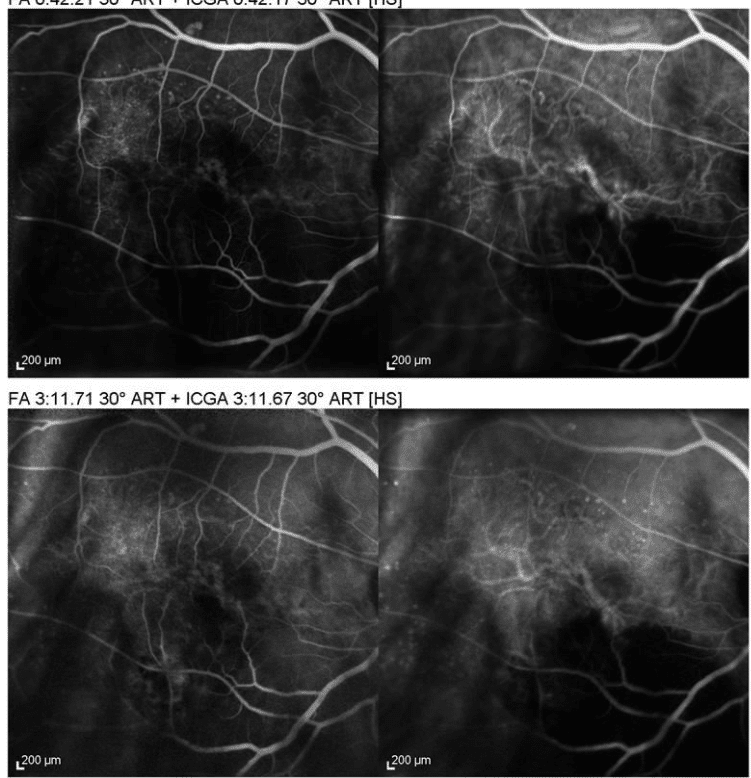 Ryan Retina, Chapter 71, Polypoidal Choroidal Vasculopathy, Xiaoxin Li OIntravitreal injection of aflibercept in patients with polypoidal choroidal. Maruyama-Inoue M, Sato S, Yamane S, and KAdonosono K. Retina 2017.